Something for everyone. Costa Rica has a profound number of museums offering compelling exhibits in the areas of history, art, archeology, science, religion, culture and natural hisotry. Find an extensive list of museums under our Attractions page. Though its music has achieved little international credit, Costa Rican popular music genres include: an indigenous calypso scene which is distinct from the more widely-known Trinidadian calypso sound, as well as a thriving disco audience that supports nightclubs in cities like San José. American and British rock and roll and pop are very popular and common among the youth (especially urban youth), while dance-oriented genres like soca, salsa, merengue, cumbia and Tex-Mex have an appeal among a somewhat older audience. Mexican mix. Mexican music is very popular among older people and some people in the countryside. During the middle years of the 20th century, Costa Rica was exposed to a lot of Mexican cultural. Cost Rica goes Celtic. Another new genre explored in Costa Rica is celtic with the group Peregrino Gris. Afro-=Caribbean beat. The music on the caribbean coast of Costa Rica has a strong African influence in the complex percussion rhythms, like sinkit. Afro-Caribbean music like rumba, calypso and reggae are popular. 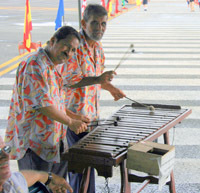 The marimba is a popular Costa Rican instrument. Traditional folk. The Guanacaste region, in the Nicoya Peninsula, is home to the best-known folk music especially pre-Columbian styles like the Danza del Sol and Danza de la Luna of the Chorotega, who also popularized the ancient quijongo (a single-string bow and gourd resonator) and native oboe, the chirimia. In most of Costa Rica, ancient instruments like ocarinas are being replaced by international instruments like accordions and guitars. There are still folk styles, even outside of Guanacaste, such as the Talamanca Canton's Danza de los Huelos and the Boruca's Danza de los Diablitos. Euro-U.S. rock and roll. From the late 90's to present time, there has emerged a newer local rock style led by bands such as Gandhi, Evolución, Tango India, Suite Doble, Alma Bohemia, and Kadeho, all of which have been accepted positively by Costa Rican youths. There are Metal bands, like Grecco, Arsenal, Advent of Bedlam, Slavon, Eternal, to name but a few. The rock bands begins a new standard to Costa Rica's music with Time's Forgotten, The Last Void, Pneuma, Sight of Emptiness. The international community starts to take a look at Costa Rica where bands like Time's Forgotten plays in BajaProg (Rock Festival) and have several reviews in the best progressive magazines, sites, and radios. The Costa Rican National Symphony Orchestra was formed in 1970. There is also an opera company, a professional choir (one of the first in Central America) and a state-subsidized youth orchestra. The Universidad de Costa Rica has a concert band and an orchestra. The National University, Universidad Nacional, has a resident string quartet and a symphony orchestra. Both the Universidad de Costa Rica (UCR), in San José, and the Universidad Nacional (UNA), in Heredia, have well-structured programmes in Music, where students can pursue bachelor's degrees in instrumental and vocal performing, composition, and conducting. The latter also has a doctoral degree in Central American Arts and Letters, with an emphasis in Music. In recent years the government, led by the Ministerio de Cultura, has aimed to revitalize traditional Costa Rican music. The National Theatre of Costa Rica. 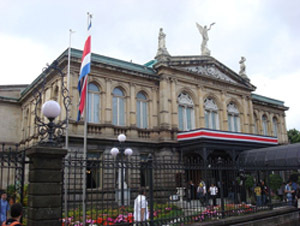 Teatro Nacional de Costa Rica is located in the central section of San José, Costa Rica. Construction began in 1891, and it opened to the public on October 21, 1897 with a performance of Johann Wolfgang von Goethe's Faust. 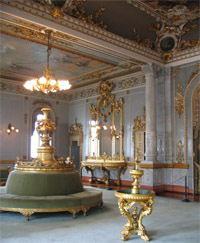 The National Theatre is the maximum representation of economical stability of the nation, in a period of time when coffee exports were a round success. The use of the theatre is limited to high quality performances, undergoing a very selective process prior to admission for performing. The building is considered the finest historical buildings in the capital and is known for its exquisite interior with lavish furnishings. The inside of the theatre features the ceiling mural Allegory of Coffee and Bananas by Milanese artist Aleardo Villa, which is featured on the five colón bill. The theatre is a tourist attraction as well as having performances several times a week. Performances by the National Symphonic Orchestra (NSO) take place at the theatre during NSO's Regular Season, and include both Costa Rican and foreign composers.